In the weeks leading to Valentine’s Day, Aldi brings in an array of limited-time, limited-availability treats and gifts. No matter who you’re shopping for, Aldi has you covered for Valentine’s Day. The discount grocery store has everything from sweets for a school party to components for a full dinner with your special someone, from the entree to sides to dessert. Here are some of the store’s Valentine’s Day food offerings. 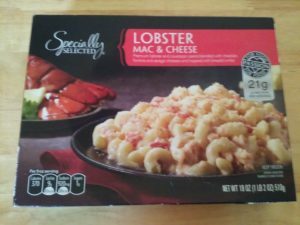 Also, check out our other post detailing Aldi’s non-food Valentine’s Day products at this link. 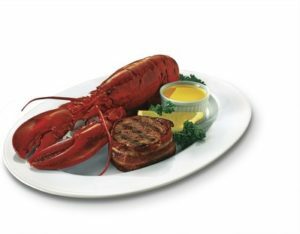 Thoughts: This whole lobster is 18 oz. and is sold frozen. Read some of our thoughts about it here. Thoughts: This contains 5.29 oz. of cheese in assorted flavors, with some in heart-shaped packaging. 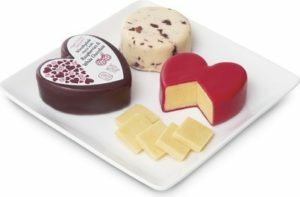 Flavors include mature cheddar (packaged in a heart shape), Wensleydale cheese with raspberries and white chocolate (also packaged in a heart shape), creamy cinnamon cheese with raisins and diced apple, and a Wensleydale with cranberries. We’re not sure how long this cheese will last on Aldi’s shelves if the grocer’s cheese Advent calendar, which sold out in a few hours last November, was any indication. Thoughts: These are 18 oz. and are sold frozen. They are some of our family’s favorites. Thoughts: This is 20 oz. and is sold frozen. 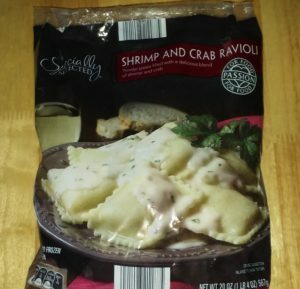 It’s among our more popular ALDI Find (Special Buy) food posts, and this ravioli appears in stores several times a year and not just around Valentine’s Day. Thoughts: 16 oz. of red and white pasta in heart shapes that can be served with sauce of your choice. Thoughts: This contains 6.35 oz. of chocolate. Thoughts: Contains 5.29 oz. of chocolate. Thoughts: Contains 8.81 oz. These also show up in Aldi stores around Christmas time. Thoughts: Contains 4.4 oz. and comes in strawberry or cherry flavors. Thoughts: This is 12.34 oz. Thoughts: These are 6 oz. and are sold frozen. Thoughts: This is 50 oz. and is sold frozen. The sampler variety flavors include chocolate turtle, chocolate swirl, triple chocolate, and double chocolate swirl. Thoughts: Contains 4.23 oz. Flavors include chocolate truffle, caramel chocolate, chocolate raspberry, white chocolate, chocolate cupcake, and chocolate cherry. Thoughts: This is 13.5 oz. and contains 10 cookies. Thoughts: Net weight of 25.2 oz. Contains 28 pouches. Thoughts: Features 24 pouches with labels for Valentine’s Day exchanges. Dove Milk Chocolate Truffle Heart Tin, $7.99 for 6.5 oz. Dove Promises Hearts, Hershey’s Valentine Kisses or Reese’s Peanut Butter Hearts, $2.95 each with net weight of 8.87 to 11 oz. Mars Valentine Exchange, $4.65 with net weight of 6.1 oz. Contains 30 pieces. Kellogg’s Valentine’s Day Rice Krispies Treats Mini Squares, $4.49, with net weight of 12.4 oz. Contains 32 mini squares. Lik-M-Aid Fun Dip Valentine, $2.95 for net weight of 10.32 oz. Contains 24 card pouches. Pillsbury Valentine Funfetti Cake Mix, $1.39 for 15.25 oz. Pillsbury Valentine Funfetti Frosting, $1.39 for 15.6 oz. General Mills Chex Mix Cookies & Cream Muddy Buddies, $4.49 for 15 oz. Hostess Valentine Ding Dongs, $2.89 for 9.31 oz. Hostesss Strawberry Twinkies, $2.89 for 13.58 oz. Dannon Danimals Be Mine Cherry Smoothies, $1.99 for 18.6 oz. Barissimo, Belmont, Benton's, Choceur, Clancy's, Dannon, Dove, Fremont Fish Market, General Mills, Happy Farms, Hershey's, Hostess, Kellogg's, Lik-M-Aid, Lunch Buddies, Mars, Pillsbury, Reese's, Reggano, Simply Nature, Specially Selected, Village Bakery. Bookmark.